An arrest has been made in connection with a large number of the bomb threats sent to Jewish community centers, schools, synagogues, and other Jewish institutions across the U.S. and in other countries throughout the world over recent months. The 18-year-old suspect, whose identity has not yet been revealed, is reportedly a dual U.S. and Israeli citizen living in Israel. Read more. Thank you, Miami, for an incredible Super Sunday and Good Deeds Day! 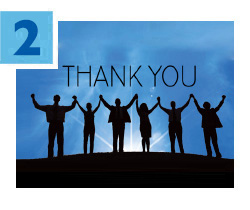 Last Sunday, more than 1,000 donors helped us raise more than $750,000 for the Annual Federation/UJA Campaign. Plus, roughly 700 volunteers made calls and completed service projects, including packing 100 purses with hygiene items, assembling 100 cleaning supply kits, making 200 blankets for hospice patients and 200 baskets of fun for local children, and so much more. Special thanks to Gaby and Joel Birnbaum for chairing our largest annual phonathon. Earlier this month, 27 members of our Jewish community joined Federation’s Major Gifts Division and Jewish Community Relations Council on the Eighth Annual Washington, D.C. Advocacy Mission, chaired by Steven J. Brodie. 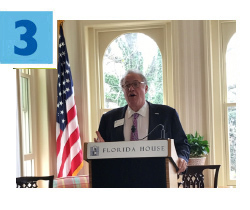 The bipartisan group met with elected officials and their senior advisors in the legislative and executive branches to discuss a number of issues important to the Jewish community. Read more. 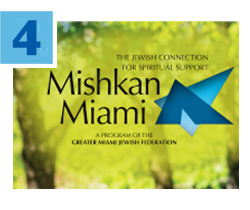 Mishkan Miami, Federation’s Jewish connection for spiritual support, in partnership with Jewish Community Services, Children's Bereavement Center and local synagogues, is offering Jewish Bereavement Support Groups to the Miami-Dade community. If you’ve lost a loved one and need a safe place to share feelings and find comfort, allow the spiritual resources in our Jewish community to assist you. All groups are open to the public; advance registration is required. 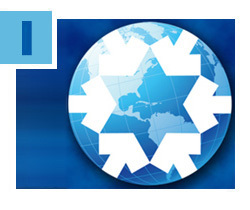 For details on groups and registration, click here. More than 700,000 Israelis ages 65 and older can’t afford to purchase or rent a home, and 27,000 low-income senior citizens are on waiting lists for subsidized shelter? What’s more, half of them are Holocaust survivors. 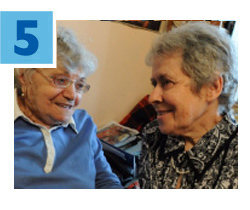 Your donations to the Annual Federation/UJA Campaign help our overseas partner, The Jewish Agency for Israel, address this crisis through its Social Housing Initiative. In addition to nearly 60 Amigour Sheltered Homes across the country, another 3,000 units across nine Israeli cities are in the works. Read more.